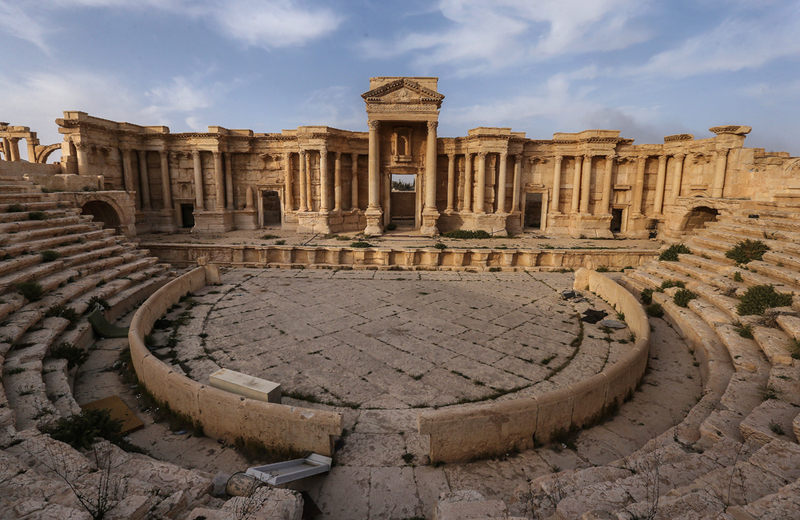 A view of the Roman Theater in the ancient city of Palmyra. Militants of the terrorist group Islamic State have used explosives-packed motor vehicles and suicide drivers to break through into Palmyra, Russian Defense Ministry spokesman Igor Konashenkov has said. "As dusk set in, Islamic State militants used motor vehicles packed with explosives and driven by suicide attackers to penetrate the Syrian army’s defense. At the cost of heavy losses they gained a foothold on the city’s outskirts," Konashenkov said. The militants had massed up near Palmyra being quite certain that combat operations in Raqqa would not resume. "The first two powerful attacks were beaten back by Syrian troops with support from Russia’s aerospace group. Russian planes dealt 64 air strikes against the militants’ groups, positions and advancing reserves," Konashenkov said. Islamic State gangs seized Palmyra (240 kilometers away from Damascus) on Dec. 10. Homs Province Governor Talal al-Barazi said the Syrian troops had managed to evacuate 80 percent of residents before retreating. The Syrian army had retaken Palmyra from terrorists on March 27 with Russian air support. Short while later Russian bomb disposal specialists helped clear the city and historical monuments of mines and unexploded ordnance.